Gay Head Street is Riding the Green Wave! 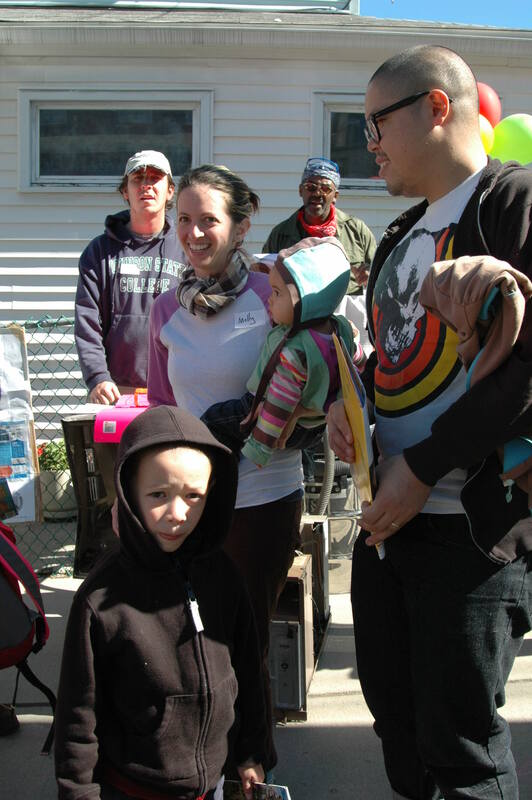 This past weekends’ 10-10-10 Green Block Party in Jamaica Plain was a huge success! Over 75 volunteers showed up to get work on Irma Mejia’s house on Gay Head Street doing energy-saving retrofits! By removing a problematic AC unit, weatherstripping, caulking, and more, the Green Home Makeover crew reduced the draftiness of Irma’s home by 20% – a reduction estimated to save her $150 on heating bills this winter alone! 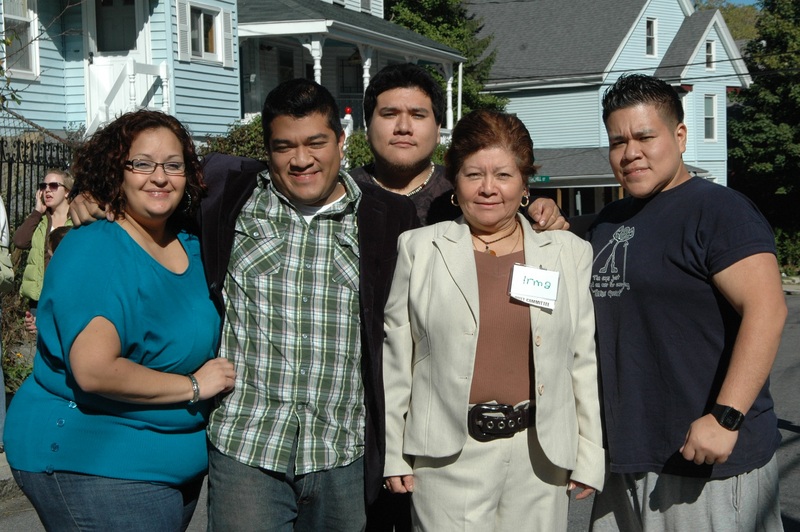 Irma’s 100-year-old house still has many, many opportunities for energy conservation and efficiency upgrades and BostonCAN will be supporting her as she engages professionals to make her home much more comfortable and affordable. Click here for more photos. Most importantly, Irma’s family and the rest of the volunteers learned new skills that they will employ to cut carbon in their own homes, and they are spreading the political message – we need fair and effective solutions to the climate crisis – to others in their communities and beyond. And since we made the front page of the Globe’s Metro section, that’s another several thousand people exposed to the message of direct and urgent action to stop climate change! ‘Green’ Apple Party (with apple cider donuts) this Saturday, October 16th, 4-6pm! Come join us at BostonCAN organizer Ninya Loeppky’s house this Saturday to celebrate BostonCAN’s recent accomplishments, meet other green-minded friends and families and swap ideas, and, most importantly, fry your own apple cider donuts and enjoy other delicious fall treats! Please call Ninya at 732-379-2905 to RSVP and get the event location. Hope to see you there! We’re kicking off two new Low Carbon Living groups with Smart Energy Parties this month. On Wednesday, October 20th, 7:00-8:30pm we’ll meet at the home we just weatherized on Gay Head Street. On Monday, October 25, 7:00-8:30pm, we’ll meet at the home we weatherized last year on Sheridan Street. The Smart Energy Party is a great chance to meet new green neighbors and friends. It also serves as the first meeting of a 4-session Low Carbon Living group designed to help you measure your carbon footprint and make an action plan for shrinking it down to a level that is sustainable worldwide. Contact Judy Kolligian at 617-522-9713 to sign up for the group on Sheridan Street, and Loie Hayes at 857-544-6846 to sign up for the group on Gay Head Street. As you can see from Sunday’s success, BostonCAN is bubbling with excitement and momentum to green Boston, but we need your help to accomplish all we hope to this winter! Please join us for a Volunteer Orientation on Friday, October 29th, from 8am to 9am at Ula Cafe to learn more about how you can help on a more regular basis. Can’t make it at Ula’s? Contact Loie or Ninya or come to another upcoming event and mention you’d like to volunteer. Previous Article Work Party and Canvassing Sunday! Next Article Boston sets goal of 150,000 home energy upgrades!